In search of food one day (when am I not in search of food? ), I wanted to get away from anything Asian. Trust me, it's pretty hard in the GVRD, especially in certain neighbourhoods. That would be the case in most of Surrey except for certain pockets. As I was driving down 152nd, I did my best to look the other way when I passed by Il Uk Jo. Can't understand why the place is still in business... Once past that intersection, I remembered a fish 'n chip joint called Al & Jan's. Formerly a Cod Father's franchise, Al & Jan went independent and continued to fry up fish for the locals. And while I was settling into my seat, it became very apparently they have a loyal following. It's nice to see customers welcomed like friends. You don't get that much anymore. Hey, this was my first visit and I felt at home! 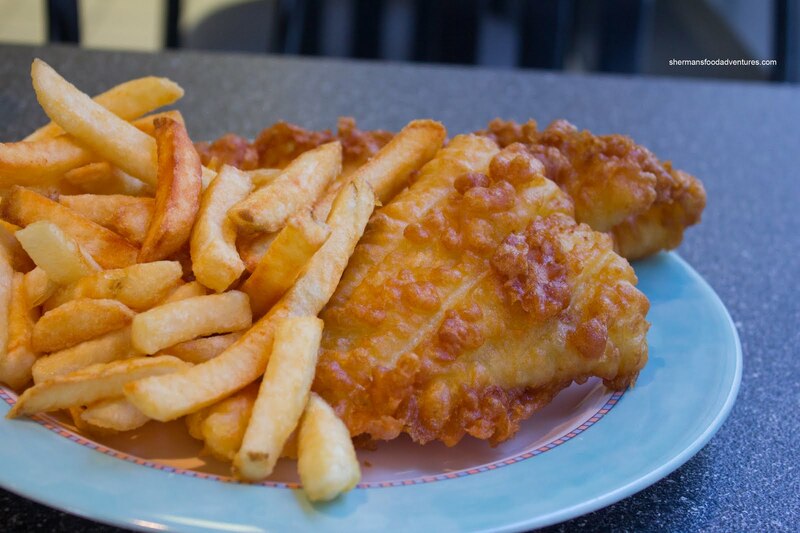 Being a fish 'n chip joint, the menu is pretty focused. Therefore, the options are limited, but honestly, do one thing and do it right. Other than my fish 'n chip order, I did start with the Seafood Chowder. I wouldn't exactly categorize it as creamy, rather, it was more like a thick broth. That didn't really matter since I could taste the sea. 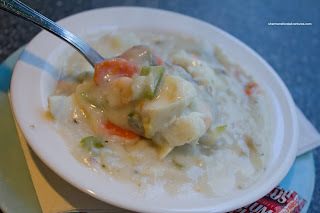 The abundance of pepper was a pleasant surprise since most chowders are pretty mild. The best thing about this chowder was the insane amount of ingredients. It might as well been named seafood stew. Lots of flaky halibut, shrimp and clams made for a very hearty soup. For variety purposes, I got the Halibut and Chips with an extra piece of Cod. I gotta say that when the plate arrived, it was piping hot. So much so, I burned my tongue while being too eager with my first bite. The halibut was moist and flaky (which can easily be overcooked, but not here). The batter was crunchy and not too greasy. As for the cod, it was soft and also cooked nicely. Due to the oilier nature of cod, it was super moist and soft. Hence, one end of it was slightly greasier than the rest of the fish. Not a huge problem though since the darn thing is fried. The fresh cut fries were fantastic. Crisp, hot and still plenty of potato goodness inside. 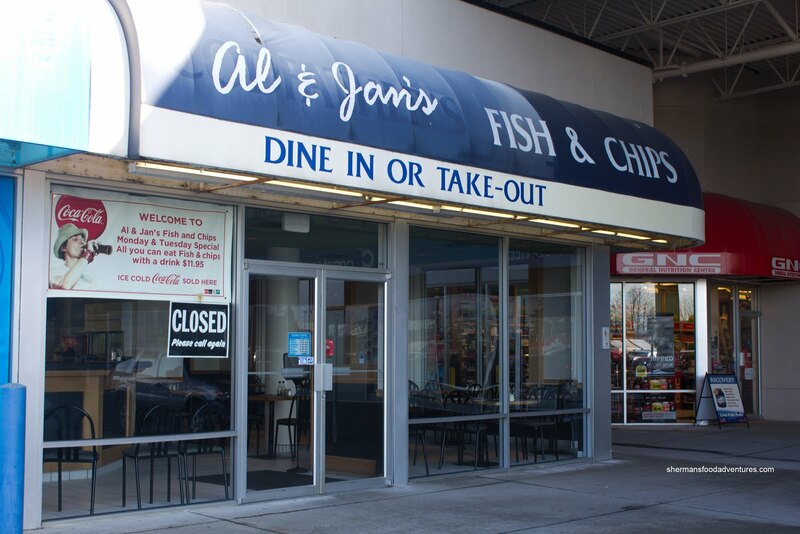 Al & Jan's is definitely a little gem tucked in the Save-On-Foods complex. 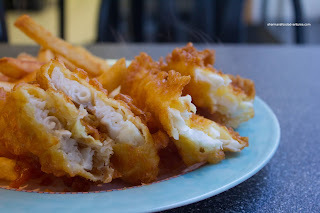 Not necessarily the first place you'd expect good fish 'n chips. However, it is better than a place like Pajo's (where it is in a more usual location I suppose). Been going to the fish and chip shops (CodFathers previously) in that building for what must be 15+ years. Closer than Ocean Ave or C-Lovers in Newton and has great fish and chips. Only disappointed they don't have fried clams. Why is this so hard to find locally?! I wouldn't call it better than Ocean Ave, just more traditional. C-Lovers in Newton has gone down my list due to them hiring too many kids with no oversight. We love this place, don't forget they do all u can eat on Tuesdays for $11 something including a drink. Jan is always so kind, better than c-lovers. Glad you finally made a visit. @cp I would certainly return, the food is one thing, but the people, they make all the difference.